The PABF (Pacific Area Bridge Federation) Championships were held in China over the last 10 days of August. 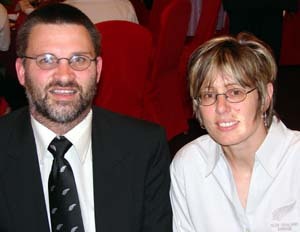 Our good friend and teacher, Wayne Burrows (cascade), and his partner Pam Livingston (both pictured), were one of the three pairs representing New Zealand in the Open Team. They joined 11 other teams from the Pacific Area for this exciting competition. After the first round-robin of 11 matches, NZ were in 3rd place with 194 VPs. The second round-robin started well and, after 10 matches, NZ were holding on to 3rd place - only 1 VP behind Japan and 6 VPs ahead of Hong Kong. The last match, against Indonesia, proved difficult - gaining only 6 VPs. Japan had a good match against Macau and retained their 2nd place. Hong Kong also had a good match against China and squeezed into 3rd place - leaving NZ in 4th place with another 194 VPs in the second round-robin. Congratulations to NZ on an excellent performance.